Here’s something to warm your heart because, Lord knows, we need the sunshine. At least on the East Coast (Damn you, Cali and your stupid February heat wave.) we got our ray of hope. Massachusetts police officer Keith Perry received a call from a Walmart store manager–a homeless woman collapsed in the bathroom from hunger. After paramedics revived the unidentified woman, Perry learned she hadn’t eaten all day, Seekonk Lt. David Dyson told INSIDE EDITION. Perry helped alleviate that by buying her bread, milk and snacks. The two-year police veteran also doled out dough for a motel room where the woman could ride out one of many New England snow storms. If only more cops were like Perry. Your favorite Georgia peach is exercising her Southern hospitality by collecting back-to-school supplies to distribute to single parents in Atlanta. 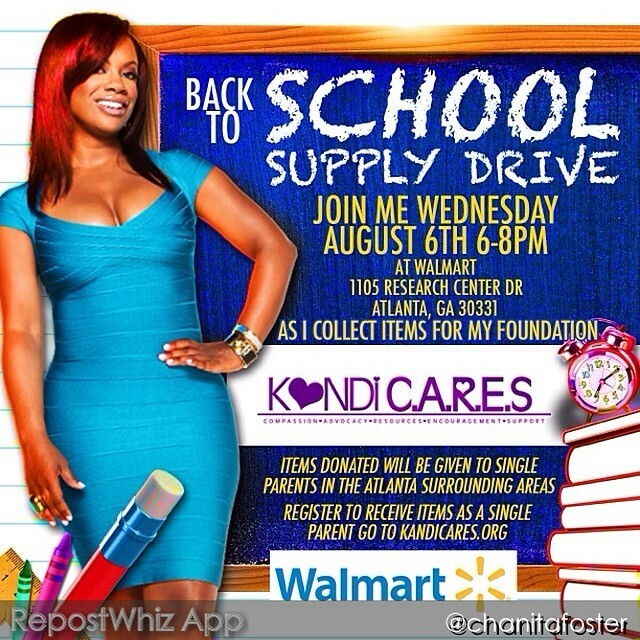 Through Kandi’s Kandi CARES charity–she’s filling her Walmart shopping cart up with notebooks, pens, pencils and three-ring binders–you can register to receive the school related swag. And for those generous Atlantans willing to contribute to the cause, you can meet the mogul housewife tonight (between 6pm-8pm) at the Walmart on Research Center Drive. Kandi’s event looked like a success. To view her thank you message, check out the video below.